Increasing the effectiveness of professional learning is the leverage point with the greatest potential for strengthening and refining the day-to-day performance of educators. The standards make explicit that the purpose of professional learning is for educators to develop the knowledge, skills, practices, and dispositions they need to help students perform at higher levels. 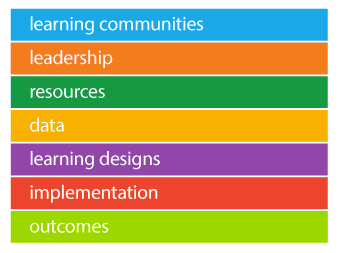 Occurs within LEARNING COMMUNITIES committed to continuous improvement, collective responsibility, and goal alignment. Requires skillful LEADERSHIP that develops capacity, advocates, and creates support systems for professional learning. Requires prioritizing, monitoring, and coordinating RESOURCES for educator learning. Uses a variety of sources and types of student, educator, and system DATA to plan, assess, and evaluate professional learning. Integrates into its LEARNING DESIGNS, theories, research, and models of human learning to achieve its intended outcomes. Applies research on change and sustains support for IMPLEMENTATION of professional learning for long-term change. Promote active engagement & deep learning that inspires action.